Powers/Abilities: Equipped with "a black light beam" built into her suit, along with "various other gimmicks". History: Black Angel was an agent for a secretive organisation. Their Angel of Darkness, she carried out unspecified missions for them. Comments: Created by Mike Vosburg. Thanks to Paul Muir for informing me of this character and supplying everything I know about her, as well as the image. He notes that the agency she worked for was "possibly called Ordenance". 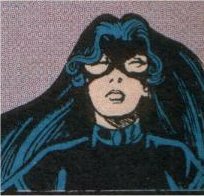 She appeared in the 1976 issue of Heroes Inc, an annual title, replacing the previous issue's Dragonella strip.